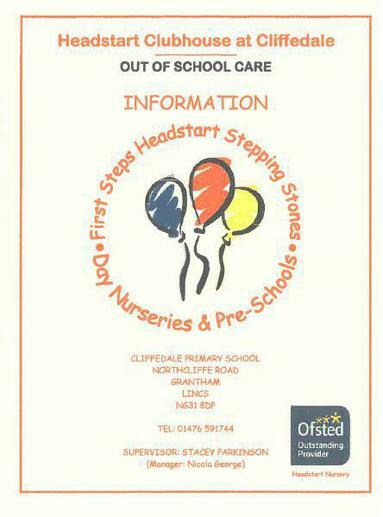 We are pleased to announce that First Steps and Headstart Day Nurseries will be providing out of school provision based here at Cliffedale. They are a group of 9 childcare facilities, the first of which was established in 1989. They are all registered with OFSTED. We are pleased to share with you further information regarding the wrap around provision that is available here at Cliffedale. Headstart Clubhouse at Cliffedale will be a completely independent operation based here at Cliffedale. If you require further information please contact them directly and they will be more than happy to answer any queries. The Clubhouse is an after school facility for children between 4 and 11 years old. They offer before and after school care in term time. Children are fully supervised at all times and there is a wide range of activities for them to choose from. The staff are highly experienced and well trained, and they are registered with OFSTED.